Habitat loss poses the greatest threat to species. The world's forests, swamps, plains, lakes, and other habitats continue to disappear as they are harvested for human consumption and cleared to make way for agriculture, housing, roads, pipelines and the other hallmarks of industrial development. Without a strong plan to create terrestrial and marine protected areas important ecological habitats will continue to be lost. Forest loss and degradation is mostly caused by the expansion of agricultural land, intensive harvesting of timber, wood for fuel and other forest products, as well as overgrazing. The net loss in global forest area during the 1990s was about 94 million ha (equivalent to 2.4% of total forests). It is estimated that in the 1990s, almost 70% of deforested areas were converted to agricultural land. Human impact on terrestrial and marine natural resources results in marine and coastal degradation. Population growth, urbanization, industrialization and tourism are all factors. Great Barrier Reef Marine Park, Australia, is a network of fully protected areas within a larger protected area, designed to protect all habitats in the region. Protected areas are one of the most effective tools for conserving species and natural habitats. They also contribute to the livelihoods and well-being of local communities and society at large. For example, well-planned and well-managed protected areas can help to safeguard freshwater and food supplies, reduce poverty, and reduce the impacts of natural disasters. 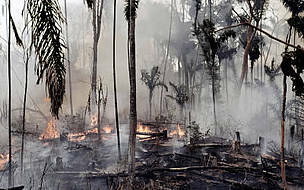 Although recent government figures in Brazil show a reduction in the rate of deforestation this year in the Amazon, burning rainforest to create pastureland for ranching and other agricultural activities continues. Amazon, Brazil. Palm oil plantations in the tropical regions of Africa, Latin America, and Asia have led the large scale destruction of important habitat for many species. The largest growth of palm oil plantations has been in Malaysia and Indonesia where large tracts of rainforest are cleared to grow palm oil crops. Orangutans, tigers, elephants, rhinos, and many other species are increasingly isolated and their sources of food and shelter are in decline. Human-wildlife conflict also increases because without sufficient natural habitat these species come into contact with humans and are often killed or captured. 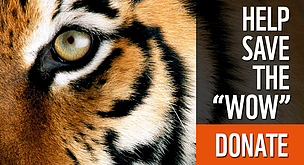 Don't buy products that contain unsustainable palm oil. Use our scorecard to help you when you shop. Only 0.6% of the world’s oceans are protected, and the vast majority of existing marine parks and reserves suffer from little or no effective management. This is despite the fact that MPAs not only help safeguard biodiversity, they can also benefit fisheries and people.